Tip: Google doesn't currently allow you to create alerts for custom email addresses - only those "registered" with the company. To get around that limitation, simply visit the website (steps explained below) using the anonymous browsing function of your web browser - in that case, you can manually type any email address you want! You will see a simple form that includes a few fields: (the email address field is a text box when you visit that site while logged out of Google - otherwise, you'll see a dropdown menu that lets you pick any email address you've registered with Google). Note: if you select "Feed" from the dropdown (vs. an email address), Google will add these updates to your Google Reader account, as an RSS feed, updated behind the scenes (what is RSS?). And you can explicitly exclude terms with a minus sign: if you are interested in articles that mention John Doe, but not "Susan", you would type ["john doe" -susan] (this is not case-sensitive). The "How often" dropdown menu lets you choose between "as-it-happens" (near real time updates), "once a day" (useful to avoid inbox clutter), and "once a week" (which may not be feasible if you need truly regular email updates on a topic or situation). Under "Email length", you can specify how many link results you will receive in your email: currently, the choices are either "up to 20 results" or "up to 50 results". In most cases, we found that up-to-20 is plenty; besides, many non-mainstream topics (in daily email batches) will not even generate 20 links. Finally, under "Your email", Google collects the email address at which you will receive your news alerts; either type an email address or pick one from the drop down (see tip below to type an email of your choice). Tip: Google automatically gives you a dropdown of the email address is has for you; but if you want to sign up for a Google alert using a different email address, you can: just sign out of Google, and the "Your email" will then be a free form text field. 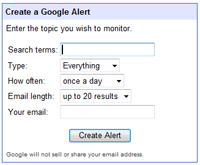 Google will send you a confirmation email: click on the confirmation link, and your Google alert is now active! You should receive your first new update within at most a few days. And this is it: you will no longer receive this email Google alert in your inbox.